At Emory's Oxford College, Stephanie Day-Goodman discovered a new perspective and a passion for art history. Deeply involved in campus leadership and service, she is one of two students chosen to serve on the steering committee for the Oxford College Strategic Plan. Maybe Oxford should thank the Girls Scouts for helping attract Stephanie Day-Goodman. The summer following her high school graduation, Day-Goodman, now a sophomore at Oxford College, worked as a counselor in a Girl Scout camp and was set to head that fall to a women's college on the West Coast. But the experience of working in an almost exclusively female environment made her rethink the decision to pursue college in a single-gender school. "I decided to take a gap year," she says, "and I started the college application process all over again. I did research and came up with seven new schools to apply to." One of those schools was Emory, though Day-Goodman says she really didn't know anything about it prior to her second search. But she liked Emory's academic standing and the fact that it was in the South. Although she grew up in Eugene, Oregon, her family's roots are Southern. 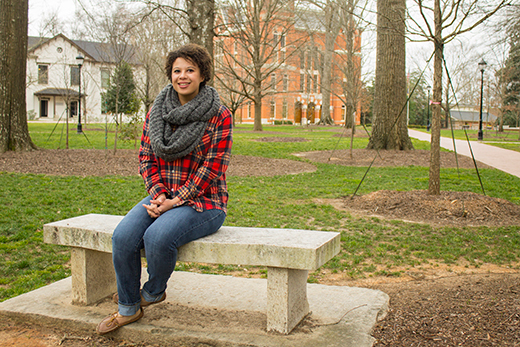 Starting her Emory undergraduate degree at Oxford appealed to her because she could study the liberal arts intensively in small classes and engage in undergraduate research as a freshman or sophomore. She arrived at Oxford with an interest in pursuing a major in public health, but that idea started to fade in her first semester when she took an art history course. "The mathematics course I was taking as a prerequisite for a health major was fantastic, but my art history course excited something in me," she says. As a result, Day-Goodman already has three semesters of study in art history under her belt, and her interest in Oxford's student-research opportunities has come to fruition. With the direction of Camille Cottrell, associate professor of art, she is studying Icelandic painter Johannes Sveinsson Kjarval this semester. "His image is on the 2000-krona bill," she says — a fact she had already learned as an exchange student in eastern Iceland during her sophomore year of high school. "I'm intrigued by Kjarval's paintings, especially his landscapes, which he painted on Cubist principles," Day-Goodman explains. "I love the way he captures the land visually." Next year at Emory College she will pursue a double, joint major in art history/history and English/creative writing. "I will always be interested in public health," she says, "but Oxford gave me a new perspective." That interest in health and wellbeing has seemed to manifest itself in Day-Goodman's deep involvement in leadership and service at Oxford, for which she was recently selected as one of the nine student leaders who are spotlighted throughout the academic year. "When she sets a goal, she works extremely hard to reach — and oftentimes, exceed —that goal," Rhiannon Hubert, assistant dean for campus life, wrote when announcing Day-Goodman as February's selection. "Stephanie does a great job building relationships, and has aided our campus in creating a respectful environment for her and her peers to learn and develop." She is an Oxford campus educator for Sexual Assault Awareness Advocates and treasurer of the Black Student Alliance (BSA). Through BSA she has been involved in activism and gave "The Challenge," the closing remarks, at Oxford's Martin Luther King Jr. celebration in January. She also serves as a resident adviser in Elizer residence hall, a role that she finds gratifying. "It's an opportunity to help keep people safe and whole," she says. It's difficult to imagine how Day-Goodman squeezes out time for anything else, but through a theory-practice/serving learning course in education, she works weekly at a local elementary school, helping teach art. Day-Goodman's impressive combination of scholarship and leadership resulted in her being named as one of the two students asked to serve on the steering committee for the Oxford College Strategic Plan. Composed of faculty, administrative leaders, staff, and students, the committee has worked since last fall to create a plan that will guide Oxford from 2016 to 2021. "I am so excited to be part of this committee," she says. "I believe this is a good blueprint for the future." Seeming to consider that future, she pauses and says with a smile, "My Oxford experience has been amazing. Maybe I'll re-enroll." If only, those at Oxford who know her would say. Instead, she can move on in her Emory undergraduate career with the satisfaction of knowing that she has helped to shape what will come after.